You see it in every supermarket and chances are you’ve bought it yourself: Balsamic Vinegar of Modena. But you might be surprised to learn that the “real stuff” is completely different. (I know I was.) Erin and I were lucky enough to go to a traditional acetaia (vinegar-producer) and see how true balsamic vinegar is made. 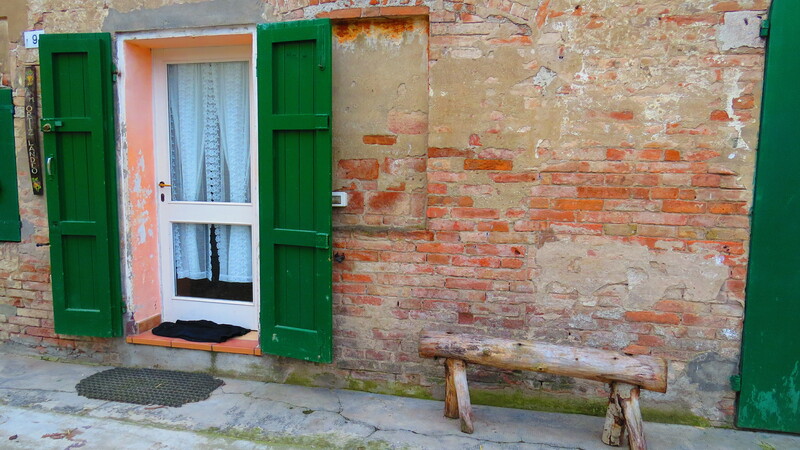 Guido Paltrinieri runs his own acetaia and agriturismo (basically an agriculture-based B&B) in Modena. He and his wife are the fifth generation to operate Acetaia Paltrinieri, so vinegar practically runs in his veins. He spoke excellent English and was very friendly. 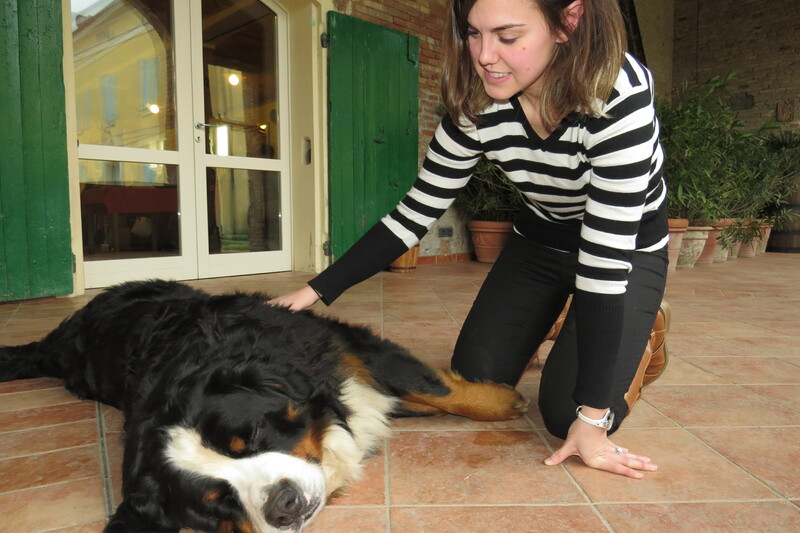 He is also the cook of the agriturismo – he does it all! (And of course the food was fantastic. 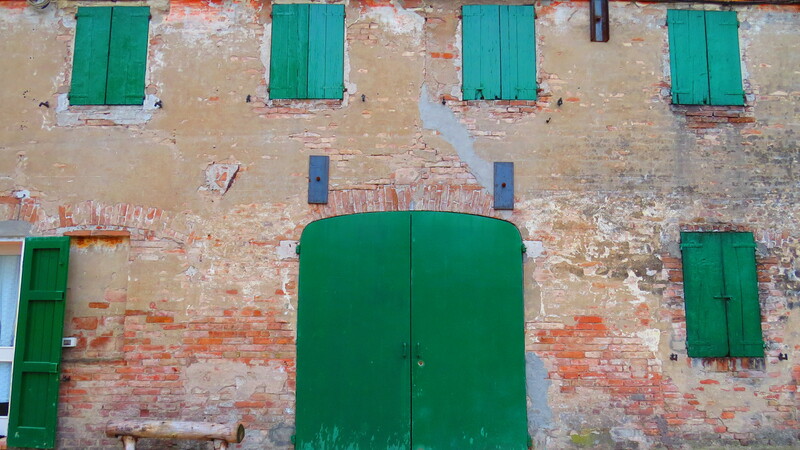 He made us gnocco fritto and a balsamic risotto – classic foods of the region.) I would highly recommend it to anyone wanting to get away for a day or two. As for the vinegar itself, wow. I had no idea of the history behind the product, let alone the method of making it. 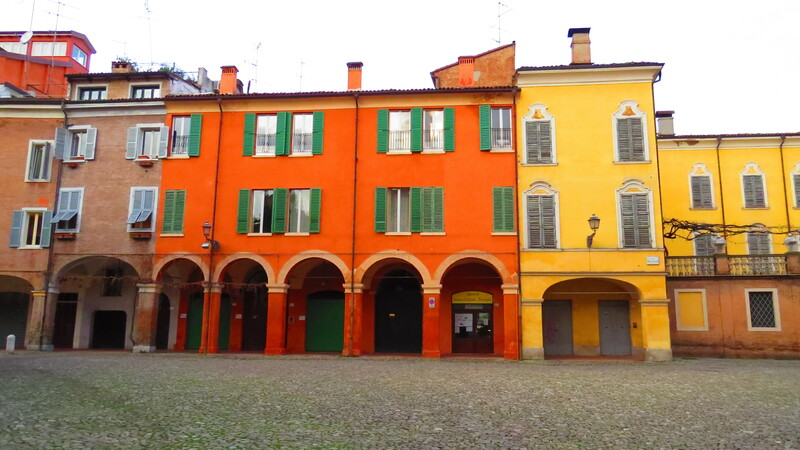 Small, family acetaias used to be very common all over Modena. Guido told us there used to be more barrels than people! They used to make it just for their own family to enjoy (much like many Vermonters make maple syrup in small batches for their close friends and family). 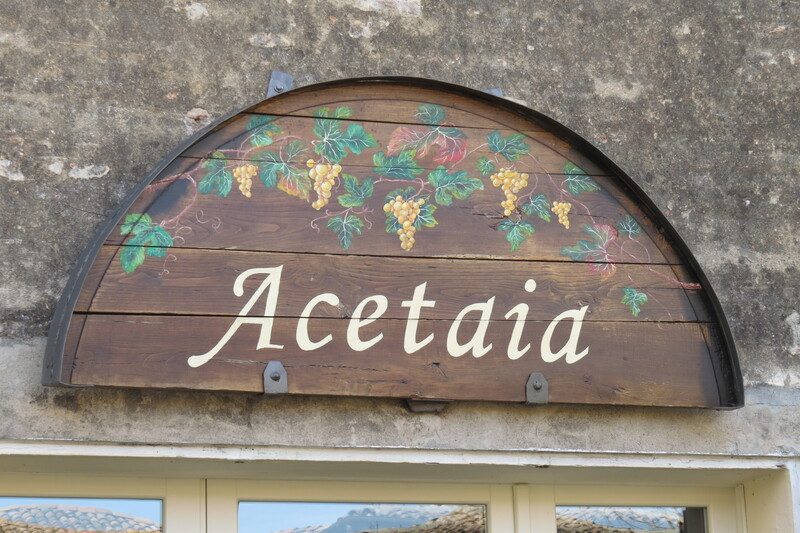 The word acetaia actually refers to the attic room in the house that was used specifically to make aceto (vinegar). Guido explained that for the vinegar to age properly, it needs extreme heat in the summer and extreme cold in the winter, so the poorly-insulated attic space was the perfect location. The traditional method of making balsamic vinegar is an exhausting one. Guido has acres of grapevines which he harvests in the fall. He presses the grapes and cooks the juice for about 50 hours. The juice reduces by up to 50% during this process. Cooking the juice breaks down the sugars and leaves it a dark brown color; we Americans call this grape must (mosto in Italian). 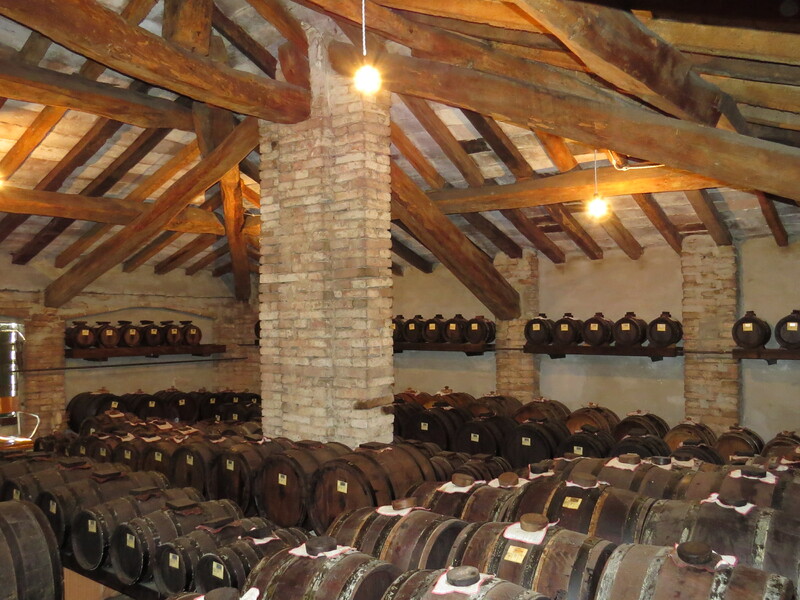 Guido stressed that the mass-produced balsamic vinegar you find in stores is made from wine vinegar instead of grape juice, and almost always has caramel color and preservatives added. From the big cooking pot, the juice is placed into large vinegar barrels to age. The key to aging the grape juice is to leave it exposed to air. 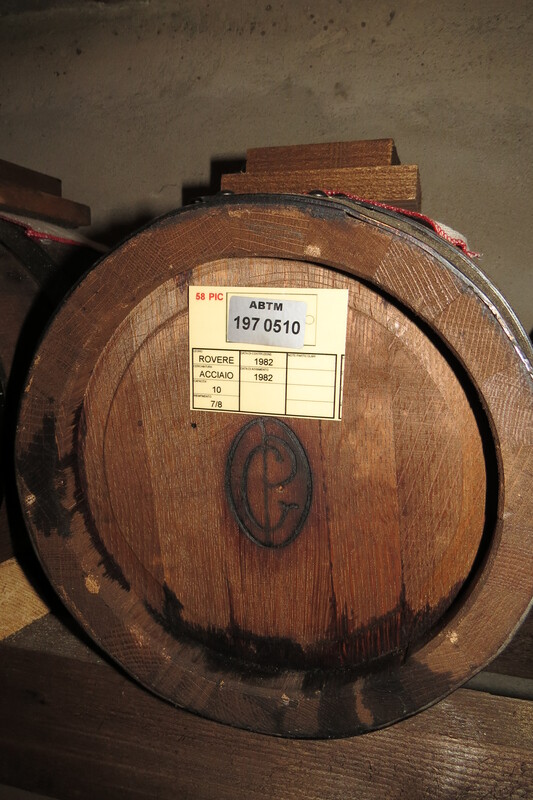 Guido explained that to age wine, the barrel needs to be completely full and air-tight. Expose it to air, and what do you get? Vinegar. Aha! So to age vinegar, you need to leave a little room for air inside the barrel and cover the hole with cloth (to keep dust out) so the juice can breathe and reduce. The reduction process is probably the most important aspect of traditional vinegar. There are rows of barrels descending in size from large 100-liter barrels down to tiny 15-liter ones. (This row of barrels is called a battaria). If I remember what Guido said, the vinegar ages in the large barrels for several years before being moved to the smaller ones. After that, every year the vinegar is moved down the line from the larger barrels to the smaller ones. Guido takes 1-2 liters of fully aged vinegar from the smallest barrel in the row, making sure to leave a good amount behind. The next barrel up the line will fill up the little one, and on and on until each barrel is filled. Every barrel is a mix of older and newer vinegar. The old vinegar helps break down and flavor the newer vinegar that is added. 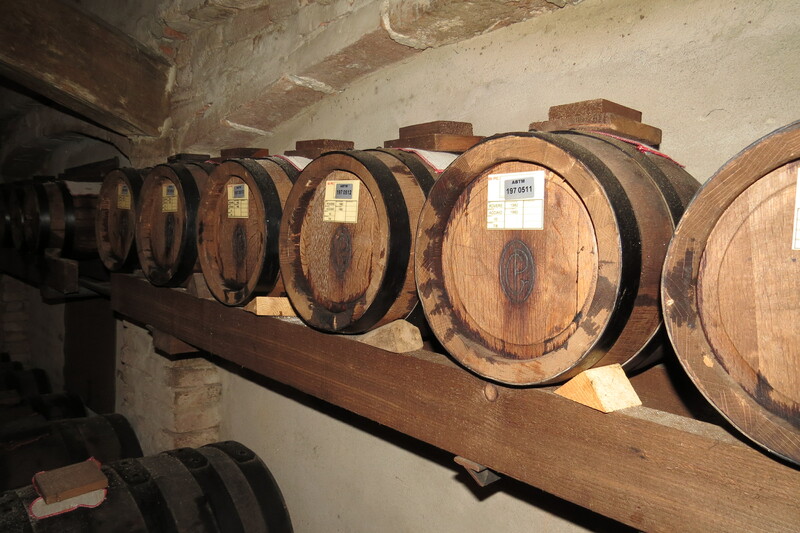 Guido also told us that he uses a mix of woods for his barrels so the vinegar can absorb a variety of woody flavors. For a balsamic vinegar to qualify as “traditional” it has to age at least 12 years. Most producers make a 12-year, a 25-year, and sometimes even a 50-year special reserve. Italy has very strict regulations about its regional and traditional products, so all the vinegar that Guido produces has to be tested and approved by professionals, who then bottle it for him with his product and labels. Aside from the 12+ year traditional vinegars, Guido also produces vinegar that is younger and therefore not considered traditional. I assume it would be cost-prohibitive for him to make solely traditional balsamic vinegar. He also sells some of his grapes and grape juice each year to families who want to make their own vinegar but don’t have their own grapes. 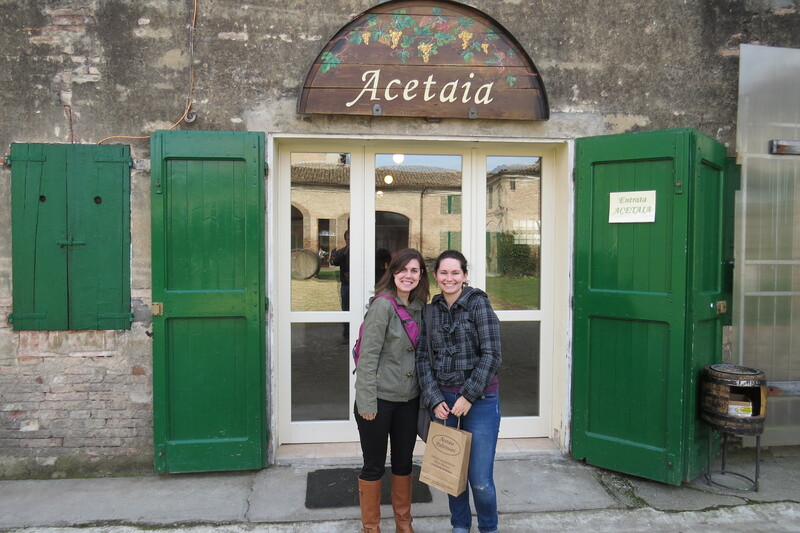 After we got a tour of the acetaia and learned how the vinegar is made, we got to taste it. Guido started us off with a 3-year aged vinegar that he makes with 30% wine vinegar and 70% juice from Guido’s grapes. Even though this was not traditional vinegar, it was delicious! I was amazed at how different it is from the stuff in the stores. First of all, it was much thicker and had a distinct caramel flavor that reminded me of molasses. It also had the classic sour bite of vinegar but with a wonderful sweetness that store bought vinegar just doesn’t have. (I ended up buying a bottle of it.) He took us through several other non-traditional vinegars varying in age and they were all delicious but seemed to have less vinegar kick and more sweetness. Finally we got to try the 12-year and 25-year traditional balsamic vinegars. They were syrupy in consistency and the oaky wood flavors were far more distinct. They were heavenly. Maybe before we leave Italy I’ll buy a bottle for myself. A single liter of 25-year balsamic vinegar takes about 20 liters of grape juice. Much of it is lost during the initial cooking process, but each barrel loses about 10% of it’s contents just due to evaporation. Just like whiskey and other spirits, this is referred to as the “angel’s share.” (If you ask me, angels have damn fine taste.) A gallon of Vermont maple syrup takes about 40 gallons of maple sap, but at least we can use it right away. I can’t imagine having to wait 25 years before I could thoroughly enjoy my pancakes! Unfortunately, because traditional balsamic vinegar is so labor intensive and takes so long to produce, the final product is expensive. Really expensive. A small bottle (looked about a quarter of a liter) of 25-year balsamic vinegar cost €75. Today’s exchange rate puts that at $102 and change. The same size bottle of 12-year vinegar was €45. Guido had a bottle on display of 50 year vinegar, but their was no price tag. I don’t think I want to know how much that would cost! So when you think of the prices he has to charge for his traditional vinegar, it makes sense that he would need to produce more affordable / less traditional vinegar as well. The bottle I bought was €14, and I also got a squeeze bottle of a thicker balsamic (kind of a reduction) that will be great with meats. Apparently traditional balsamic vinegar is often eaten with strawberries and highly recommended on ice cream! Seems strange, I know. The vinegars I bought aren’t the fancy traditional ones, but I’m going to have to try them on ice cream anyway. The acetaia and vinegar tasting were excellent, the lunch Guido made us was delicious, and we even got to meet some of the local wildlife. Did you see all those furry faces?! It was overall a fantastic experience and I can’t speak highly enough of Paltrinieri Acetaia and Guido himself. Hopefully I’ll be able to make it back there with Alex someday. 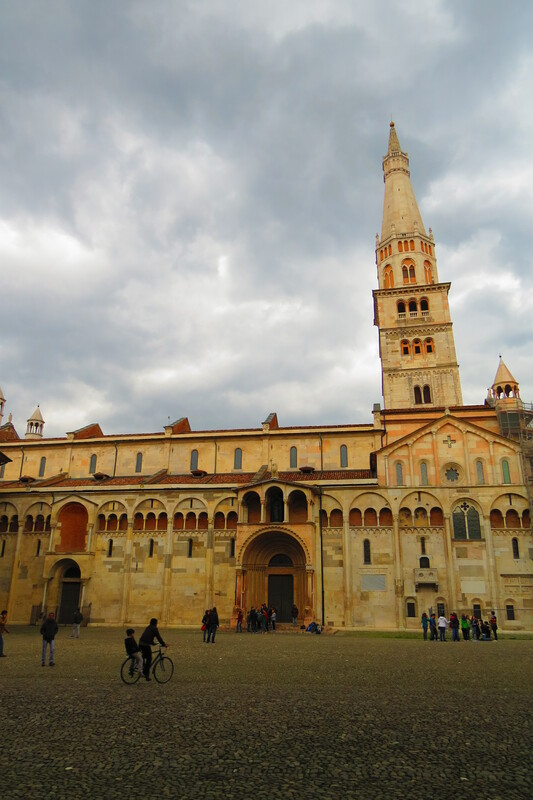 After the acetaia, we got to have some free time in downtown Modena. 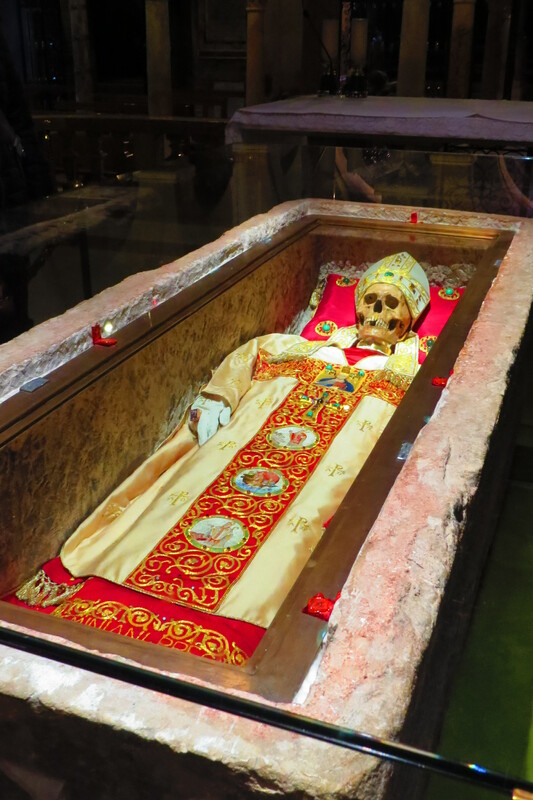 It seems like a fun little town; Erin and I walked around and checked out the main piazzas and the cathedral…. 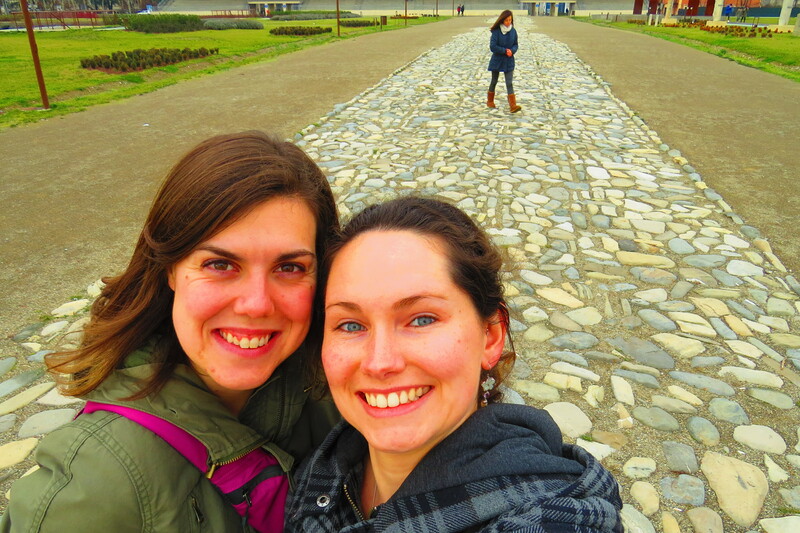 And we also checked out a confusing park with some Roman ruins and a museum…. Definitely worth checking out if you’re in the area! 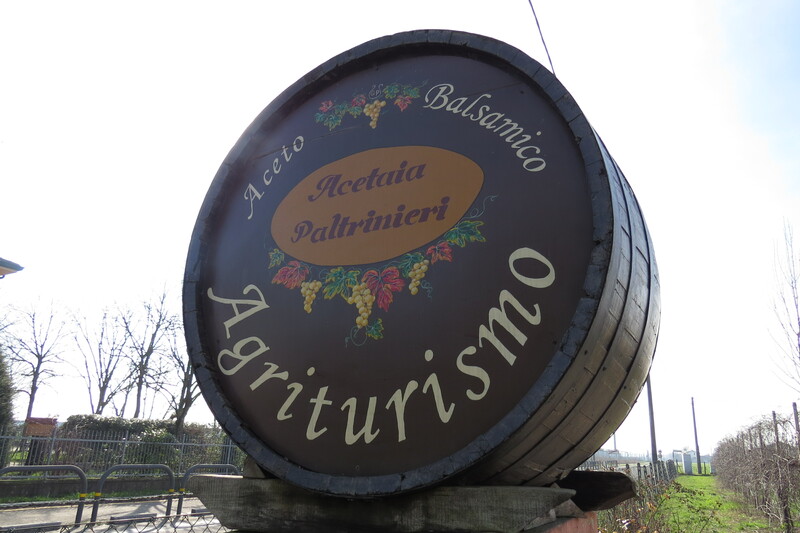 This entry was posted in Fooding, Italy, Travels and tagged acetaia, agriturismo, balsamic vinegar, Italy, Modena, Traditional Balsamic Vinegar, travel. Bookmark the permalink.